I am soooo looking forward to seeing WordPress FLY today. And more importantly, I’d love to see all of YOU fly. I realize this is no museum piece, here, but I could not draw in September, 2014. I have been diligently practicing, though, and I keep improving every day. I am proof that anyone can draw; it is not some mythical gift. I believed that all my life, because my brother and sister really CAN draw, paint, sculpt, design and build things, including furniture; you name it, they can do it. Like, really well. I never could. I compared myself to my brother (he and I are the youngest two of nine – yes, we were raised Catholic), and I couldn’t do what he could do, so I figured I didn’t have “the gift”. Well, respectfully, that’s horse hockey (thank you, Colonel Potter). 1. Get hold of the book “Drawing on the Right Side of the Brain”. It’s a classic drawing text; most any library should have it, or you can buy it here. 2. Draw a lot. Get a little sketchbook and take it with you. Slip it into your purse or leave it in your car and draw anytime you have to wait somewhere or, whenever you get the urge! Before you know it, you will improve. 3. My other suggestion is to watch YouTube videos about whatever medium you prefer. They’re free, they’re abundant, and they help! http://www.arttutor.com and http://www.artistsnetwork.tv are two other options that are about $20/month for all the videos you want from lots of well-known artists, for most any medium. They’re both wonderful and I can highly recommend them both. I’m sure others would have other suggestions; I’m only sharing what has worked for me. The other thing that’s been huge for me personally is sharing my work here with all of you, and interacting with so many people at every skill level, all of whom have the passion to create. I find the art community to be extremely supportive, kind, warm and helpful. I so appreciate all of you who help me improve here every week! Thank you again, and Happy Draw a Bird Day to you! ***Shake thy tail feathers in unison***! Peace. I totally agree with you about ‘Drawing on the Right Side of the Brain’ – it’s a great place to start, and if its examples don’t prove that anyone can draw, I don’t know what will. 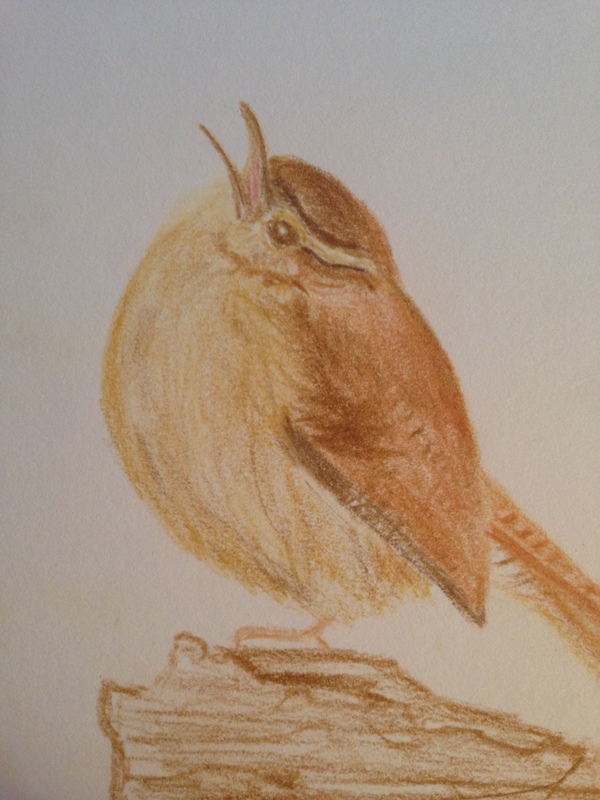 Dear Laura -fabulous little wren! I love your enthusiasm about learning to draw. Drawing and other forms of artistic expression brings me great happiness and I can see you are receiving the same gift. Have a great day. We will keep the inspiration going! Oh Laura! That wren! The beak is what strikes me on this drawing as so distinguishing. And the chubby round shape that is so distinctive of these cute little birdies! GORGEOUS! Knew what it was right away – of course. Simply beautiful. Great post. You are really sharing and spreading your joy and love of art. I know you’ve helped me “catch the bug!” Thanks for all you do and who you are! So Happy to Shake My Tail Feathers with you today! HAPPY FRIDAY! And Happy Mother’s Day Weekend! Love ya! Thank you Jodi! I was stuck in an 8-hr webinar yesterday and had to work during it. This guy was rushed and it was so much harder than I thought it would be, but at least I learned from it. I’ve always wanted to draw a little wren. Thanks so much for your enthusiasm and for helping us fly today!! UGH! Love that you got to multi-task though 🙂 It so does not look rushed. I need to consider watercolor pencils for more detailed drawings, but sheesh – so much I want to do – not enough hours in the day!!!!! 🙂 You rocked the Wren! Thanks! This one was actually my colored pencils. Argh and I haven’t posted the recs you wanted. Are you interested in everything or just pens and pencils. Maybe I should do a post about this. But maybe I should become a Blick affiliate first lol! But seriously their prices and service I’ve found to be the best. And you can return opened, used stuff for up to a YEAR, no questions asked. I’ve found NO other company that allows that. Thanks, my sweet! The Blick affiliate thing is real; they actually give you 10% of whatever people buy if you link to Blick on your site, they approve you, and you belong to the program! I don’t want to be a “commercial” site, but I push Blick all the time because it’s (IMO) the best and I love dealing with them. So why not become an affiliate? I’ve toyed with the idea many times. It’d be a great way to help offset the cost of all my art supplies that I discuss here. haha, oh I can sympathize, believe me. I thought you said you ordered them today, lol. Oh the meno-ness. hehe. I thought they were sending drones to your place. What a cheerful start to the day! He/she is adorable. And good suggestions for those who need to get those pencils moving. Thank you so much, and thanks for your beautiful birds!! I agree, “Draw a lot!” You’ve come a long way – your bird looks like it is singing a lovely song. And you are certainly one of the extremely supportive, kind, warm and helpful people here. Hugs! You have been very encouraging and inspiring. I think your talent lies in drawing, actually – truly! You really capture those famous people in those portraits you have done, they are so recognizable. Keep drawing – and I need to draw more, too. I haven’t seen all of your work, so I don’t know all that you can do – but I do so admire your drawing ability. Wow. Thank you so much. I’d love to see your drawings! I fell in love with watercolor first, and backpedaled to drawing because it was taking me forever to do the under-drawing for the WC painting. And I do enjoy it, but the WC holds a different feeling for me; I think it’s a different kind of freedom. I’m not sure if I’m expressing this well. I can’t really put my feelings for the medium into words, but the short story is I’d love to become a watercolorist whose paintings are that much better because the drawing underneath was solid. Perspective is a major problem for me, still. Even certain portrait angles carry a built-in perspective issue. Anyway, sorry for the ramble, and thanks for your encouragement and praise; it means a lot! Kathy, I am so happy, because truly you are a gifted photographer, and your wildlife photos are stunning!! If you need help with the sharing side, let me know. I googled “linking to other websites on wordpress” a few weeks back and got some great, short youtube tutorials that helped me a lot! I think I might try to post the grosbeak and wren pictures you drew (if my saving of them worked right) and link to your blog, and post one that Jill Kuhn did over on her blog. That okay? Of course! I’d be flattered! Oh, and Jill will be so happy too. That’s very kind of you, Kathy, thanks again! Oh, and thank you so much for your lovely photos, which will be keeping me busy this weekend, my friend! You have the “gift”, too — I love the illustration! A wonderful slaphappy Friday to you as well as Mother’s Day weekend. And as you say, let the May “Draw a Bird Day” fly!!! My day is quite crowded already, but reading this has made me want to daw a bird before the day is over. I hope to get back to you on that. Aww I hope you do, David!!! Oh it’d be a beauty!! We’ll keep doing this on the 8th of every month, I think, if there’s enough interest (FYI). Thank you so much Jill!!! Happy Friday Shake thy Tailfeather Day! You are so talented tooooo! We make a lovely mosaic, all of us together!! Ack, today was… blahhh well I got to draw my bird! Late in the evening but still on time! Yay for bird day! Thank you!!! I’ll go look at your birdie, I’m so glad you joined us!! I still can’t believe I forgot about this day. 😀 I like your adorable wren, though! No worries, Teresa, if there seems to be enough interest (and I’m thinking there might actually be, lol!) then we’ll do it again next month. Every 8th! 😀 I’m not happy with this drawing at all; I didn’t plan ahead and had to rush it, but thank you for complimenting it. I hope you have a terrific weekend. Oh I love wrens! what a little sweetie it is. Your drawing skills just keep growing….well done. Thank you, Rachel. I always appreciate your comments. He (or she) is so adorable! Lovely capture of this little fellow! I started a bird on Friday, but the day got filled with work projects that I wasn’t able to finish him up… Really love your birds! Will you be doing a A-Z series on them? Thank you so much! Oh, I’d love to see your birdie, if you do finish him. That’s a good Q. I’m thinking about doing a series on wildlife of all kinds, including birds. I’m wondering about the alphabet though….I’m starting to feel a bit constrained by it. (I bounce back and forth between challenged (in a good way) and constrained, actually.) I’m wondering if I should abandon that aspect, but every time push comes to shove, I keep going with it. What do you think I should do? Thanks, BB. For now, I think I’ll stay with it. But I do go back and forth. I’m glad to have your thoughts about it, thanks for taking the time to comment.